Earlier this week, Scholastic released the results of the fifth edition of its national survey on the state of kids and reading known as the Kids & Family Reading Report, and some of the conclusions are a bit hard to swallow. Half of all children ages 6–17 (51%) are currently reading a book for fun and another one in five (20%) just finished one. Both parents of children ages 6–17 (71%) and kids (54%) rank strong reading skills as the most important skill a child should have. Yet while 86% of parents say reading books for fun is extremely or very important, only 46% of kids say the same. Three-quarters of parents with children ages 6–17 (75%) agree “I wish my child would read more books for fun,” and 71% agree “I wish my child would do more things that did not involve screen time." The report also shows that something needs to be done to sustain children's reading interest beyond age 8, after which it sharply declines. Another pressing issue raised by the report is the fact that boys aren't reading for fun as much as girls. 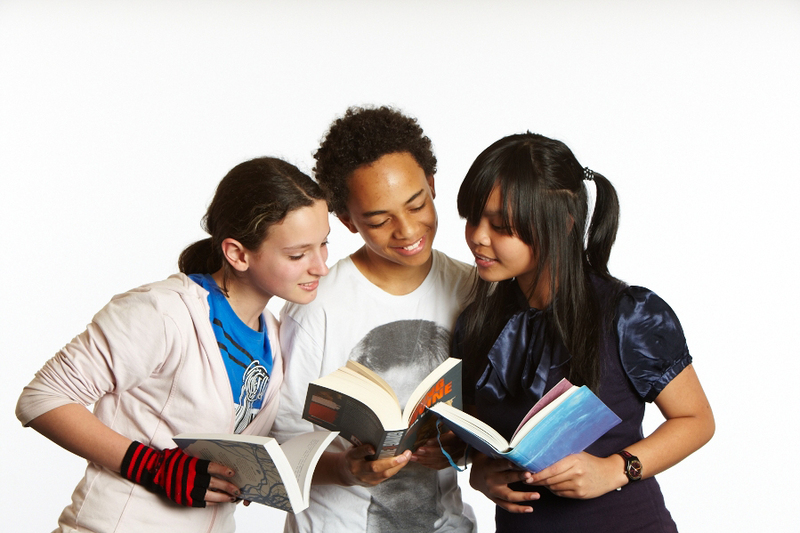 In 2014, 56% of girls said reading was very important, whereas only 36% of boys agreed. Children's overall perception of reading importance even decreased by 5% between 2012 and 2014 – from 51% saying it is very important down to just 46%. The fact that more than half of children surveyed are reading for fun is amazing, that is, if you're looking at the glass half-full. But to think that almost just as many kids aren't reading for fun is heart wrenching. And yes, it's great that most parents want to see their children doing things that don't involve a screen, but how on Earth has it gotten to the point that 71% of them are compelled to feel this way? How can parents get their children spending less time in front of a screen and more time reading for fun? We've all heard the expression "Monkey see, monkey do," and when it comes to reading, it's no different. As someone who was raised as a bookworm, I will tell you from experience that my parents' reading habits served as the foundation for my own. I can still remember laying in the bed I shared with my sister, our mom sandwiched between us reading aloud while my dad laid at the end of the bed and listened along. I didn't know it then, but those countless nights spent reading with all four of us cramped on a tiny double bed would become some of my most cherished memories of us all together as a family. When it comes down to it, all it really takes to be a reading role model is a little effort. Here's a couple steps I would recommend to help get the children in your life reading. Be seen: It's no secret that kids mimic the things they see others do, and this is particularly true for parents. Instead of coming home to plop down in front of a television or laptop, pick up a book and get reading. If you enjoy using eReaders, make sure you tell your kids that you're reading a book, not playing a game. The more kids see you interested in books, the more they will become interested too. Read aloud: Even better than reading a book in the presence of your children is reading to them. Once your child is old enough, switch roles and have them read aloud to you! This is a great way to spend time with your children while having fun and improving their literacy skills. Ask questions: When you read a book with your children, be sure to ask them questions to gauge their comprehension and interest in the book. Do you like this book? Who's your favorite character and why? What do you think will happen next? What is one thing you could ask the author if you could talk to him or her? Do you think this book would be a good movie? The power of choice: According to Scholastic, 91% of kids say that their favorite books are the ones that the pick out themselves. What better way to do that than by bringing the children in your life to local libraries and book stores? To see the full results from the State of Kids & Reading report, click here. To view the Kids & Family Reading Report in it's entirety, visit scholastic.com/readingreport. I invite you to share your experience of being a reading mentor with me on Facebook or Twitter, using #TessaFoxReads. Tomorrow is National Readathon Day and a great time to get your little ones (and yourself) reading! I've heard many people say that physical libraries are becoming irrelevant and a way of the past. With technology constantly on the rise, who wants to go to some building and dust off a crummy old book? Lot's of people – that's who. In fact, more people than ever are using the local libraries. A 2010 survey by the Institute of Museum and Library Services, the federal agency that monitors library usage, reported a 32.7% increase in physical library visits between 2001 and 2010. The American Library Association also reported an increase of library visits – a staggering 61% increase between 1994 and 2004. Similar increases were found in Canada, where overall library usage surged by 45% between 2000 and 2009, including a 16% increase in book lending. The truth is, libraries are still relevant (and thriving) because they are finding ways to adapt and evolve, something they must continue to do into the future with the ever-looming harsh budget environment. A December report on British public libraries recommends that for public libraries to survive today, they must begin taking cues from coffee shops. "The wi-fi connection should be delivered in a comfortable, retail-standard environment, with the usual amenities of coffee, sofas and toilets," the report states. While I would argue the majority of U.S. public libraries already offer most of these services (albeit the coffee) they also must expand their digital services like e-lending if they are to continue to be viable, or so NPR explains. I think an online presence for individual libraries is also a must to ensure their survival. For example, just look at all the good social media has done for the Ferguson Municipal Public Library! The idea of libraries mirroring coffee shops sounds nice. I can just imaging sipping a hot Chai Tea Latte while pursuing a book in the back of the stacks – but there's one flaw. Many public libraries ask that their patrons do not eat or drink inside the building to avoid messes, especially food and beverage stains inside books. But if there's one thing I've learn from working at a circulation desk – and believe me – those stains (and others) have already found a way into most books. Maybe we can pass a mandatory sippy cup rule? If you're like me, you read simply because you want to – because you want to learn something, because you want to escape, because you want to go to sleep but you're just not tired yet. I don't read because I know that reading for just six minutes can reduce stress by 68%. I certainly don't read because my love for reading could make me 2.5 times less likely to develop Alzheimer's that other oldies once I'm a senior. But if you need a reason, maybe I can help persuade you to read – non-digitally. Reading has all sorts of benefits, and it turns out that reading actual books is even more advantageous than their digital counterparts (sorry, eReader fanatics). As this great article on Mic.com points out, reading in print helps comprehension. A 2014 study found Kindle readers were significantly worse at remembering the order of events in a mystery compared to those who read the paperback version of the story. Science explains that this is because the inability to physically control the pages of an eReader limits its reader's sensory experience, thus affecting recall. Not only that, but reading things like short, 140-character tweets could actually cause people to lose some of their literacy skills. This photo was taken during my semester abroad in Paris where I chose to reread Dan Brown's The Da Vinci Code, this time in French. Here are a few more reasons. Reading a good old-fashioned novel at a relaxed pace for at least 30 minutes a day is a great way to distract from modern technology. Studies show reading can also increase empathy, and can even improve the quality of your sleep. And he best reason to read books? IT'S FUN!